Marketers continue to spend more and more on programmatic advertising, but no channel is growing as rapidly as mobile. Marketers spent 109% more to buy mobile ads via programmatic during the first four months of 2014 compared to the same period one year ago. While mobile was by far the fastest-growing channel in terms of year-over-year spend increases, marketers spent more across the board. 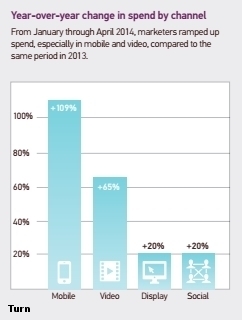 Spend was up 65% year-over-year for programmatic video ads, while display and social media spend were both up 20%. The data comes from Turn, a demand-side platform (DSP), and its latest Turn Advertising Intelligence Index report. The company’s first “Advertising Intelligence” report came out three months ago and measured how competitive certain verticals are in the programmatic marketplace based on the Herfindahl-Hirschman Index. Essentially, the HHI measures competition based on how monopolized a certain vertical is. If the market is seeing an increase in competition, it means it is moving away from monopolization. Turn used the HHI to measure competitiveness again in its latest report and found that the Travel and Telecom (both 49% more) and Financial Services (38% more) verticals are significantly more competitive than they were one year ago. The Arts & Entertainment (15% more) and Home & Garden (11% more) segments are also more competitive. The Sports & Recreation segment is 78% less competitive than it was one year ago, followed by Autos (71% less). Apparel is 36% less competitive year-over-year, but Turn notes that year-over-year spend in the segment is up, indicating that it remains a competitive vertical when it comes to winning bids.